Out of Stock ETA Oct - Nov. 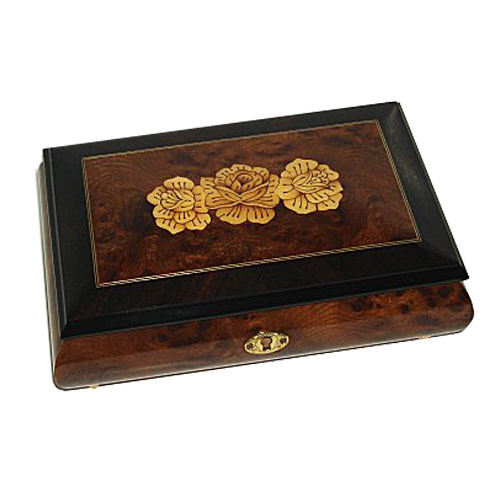 The Simple elegance of three flowers grace the lid of this beautiful burled elm box with walnut boarder. It measures 8" x 5 1/4" and stands 3" high on little brass feet and has both lock and key as do most upscale musical boxes. It has a ring bar in its sueded beige interior and the option to view the mechanism or remain covered. You may select your favorite melody from our 18 note tune list.